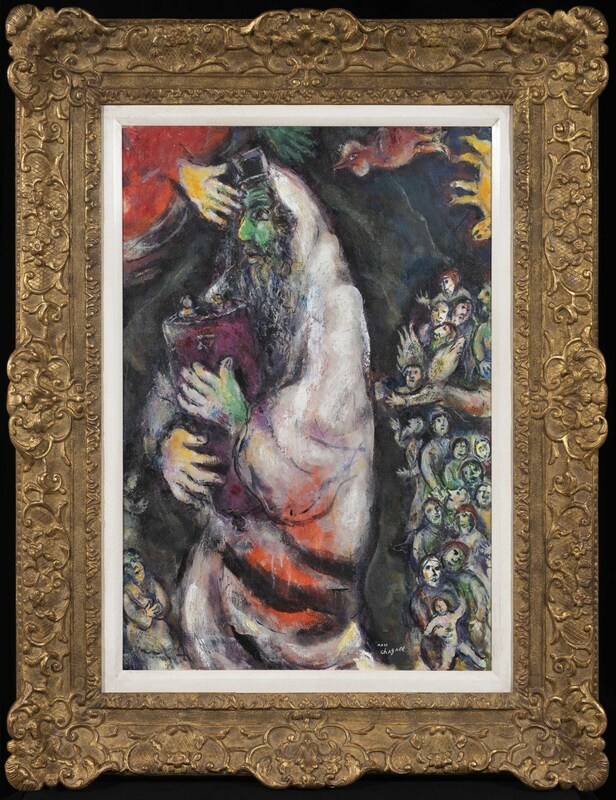 This work is accompanied by a certificate of authenticity issued by the Comité Marc Chagall, signed by Jean-Louis Prat, dated 7 June 1988, where the work is archived as HT793 as recorded by Chagall. Chagall’s paintings are filled with religious, cultural, and symbolic references. Born into a Jewish family in Russia 1887, his work is unique in its transformation of Russian folk culture. Merging folk and religious iconography let Chagall adapt his biblical paintings to suit his highly Modernist style, and 'Le prophète et l’ange' is a celebration of this. 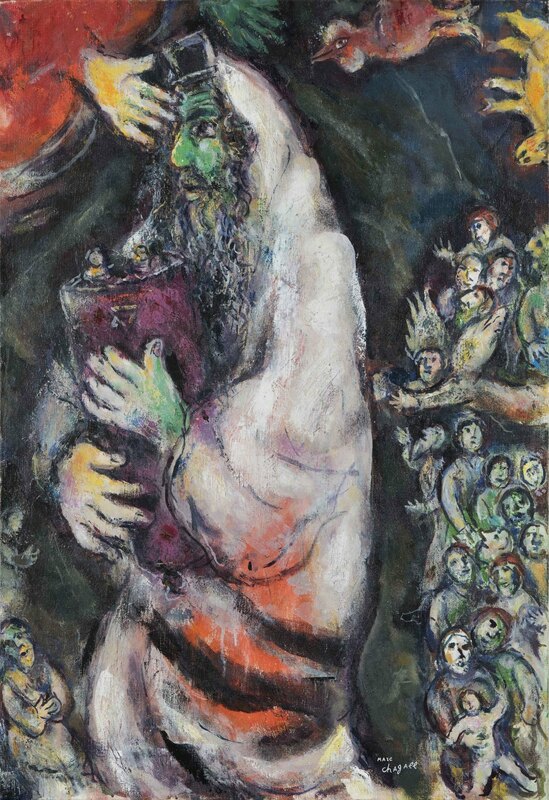 Chagall created his first paintings of a Rabbi and of the Prophets in the 1910s, with Jewish iconography remaining an enduring fascination throughout his career. 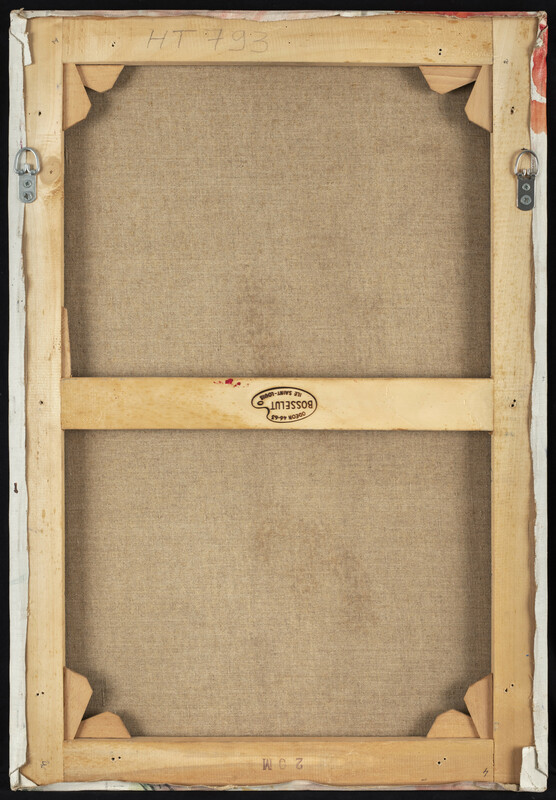 From 1955 – 1966 he worked on a cycle of 10 Biblical oil paintings, and between 1952 – 1956 created a suite of 24 coloured lithographs entitled ‘Drawings from the Bible’ which were published a few years later. With his ever-increasing preoccupation with the Bible, Chagall was able to produce images that highlighted the triumphs of humanity. Painted in 1967-68 'Le prophète et l’ange' is filled with the characteristic poetic motifs that are synonymous with Chagall’s style. Having settled in Saint-Paul de Venice on the Côte d'Azur with his wife Vava in 1966, Chagall’s works from this period are often filled with the nostalgia for a pre-War life. The animals in the upper corner of 'Le prophète et l’ange' are not just dream-like apparitions but fragments of memories from his youth in Belarus. In 'Le prophète et l’ange' a hand reaches down to bestow a blessing upon the prophet, causing a crowd to follow, staring up in awe. The prophet, exalted, stands above the other figures in both virtue and physical size. The rich vitality of the contrasting red and green tones creates a vibration that echoes the surging movement of the crowd and mimics the excitement of the scene. At this time, Chagall had reached the pinnacle of his international fame. He had been lauded for his 1964 decoration of the Paris Opera House and in 1969 a major retrospective of his work at the Grand Palais, Paris was opened by the French President. In the year he created 'Le prophète et l’ange' Chagall was also commissioned to make a mosaic for the University of Nice.